Here at DeMarco Mechanical, we know the frustration which comes with finding the best possible furnaces to keep you warm during the winter months. 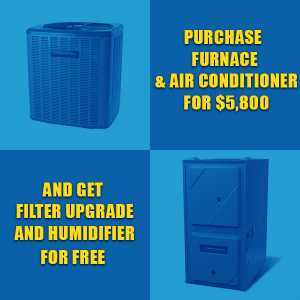 As the Greater Toronto Area’s number one HVAC contractor, we take it upon ourselves to provide our customers with complete rankings and ratings of the best furnaces on the market, as rated from sources all around the internet. When selecting a new furnace for your home, we always recommend doing research and taking the time to select a furnace which matches your home’s energy consumption, heating requirements and winter needs. We’ve assembled a guide to selecting your furnace, for your benefit. Read on below to find out more. Keep in mind that newer or recently remodeled homes, as well as those with insulated windows and doors, will have slightly different heating requirements, as will homes built before the 90’s. The best way to determine your furnace heating needs is to perform a load calculation test. This test is likely offered by your HVAC contractor, and will help you determine the best furnace for your needs. Load calculation is performed by inputting your home’s information such as: foundation materials, building materials, age, location, windows, flooring, roofing, size, doors, etc. and using the results to match your requirements to a furnace. DeMarco Mechanical can help you do precisely this,and will help you optimize your furnace for the upcoming winter months. Another factor to consider is the furnace’s AFUE rating, which is the percentage of energy used for heating. A furnace which has an AFUE rating of 90% will therefore heat only 90% of it’s BTU capacity. So, for your 3,000-square foot home, a 120,000 BTU rating furnace with a 90% capacity would heat just about 108,000 BTUs. When shopping, remember to factor in this rating to help you determine your final purchase. This list is compiled by various internet sources, and is accurate for 2017. These furnaces vary in efficiency from 80% to 98%. 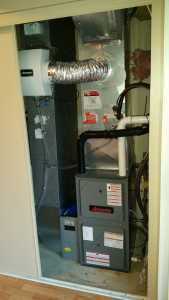 Remember that the minimum efficiency rating in Canada, for a gas furnace as of 2012 is 90% AFUE. 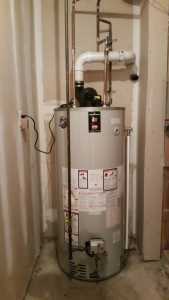 Furnaces below 90% AFUE are not acceptable for installation, and cannot be purchased from a retailer. The Lennox Merit Series is an affordable model with a mid-range consumer rating, and an efficiency rating of up to 98%. The Merit line comes in a variety of models with varying efficiency and make. This furnace provides single-stage heat and uses Lennox Sure Light™ ignition for reliable use. The heavy, durable steel gauge design of the exterior ensures quiet operation and minimal heat loss. The Frigidaire FG7TC is up to 95.1% efficient, and offers reliable two-stage performance with variable speed motor. This unit is slightly more expensive, but is designed for precise comfort control and quiet airflow. This small gas furnace is designed for high-efficiency in a compact, 33-inch cabinet. Depending on the unit, extra heating comfort is provided in the shape of a modulating burner or variable speed blower. The Amana AMVM97 has an AFUE rating of up to 98% and features and efficient and quite variable speed circular motor, as well as a stainless-steel tubular primary heat exchanger. This EnergyStar© certified product is among the most energy-efficient and quiet on the market, but is also relatively expensive. The Ruud Achiever features the PlusOne Ignition system, which is a patented direct spark ignition system. This furnace features a -segment LED display and patented heat exchanger which is designed to reduce operating sound while improving efficiency. This product is up to 95% efficient, and is a higher range product. Up to 98% efficient, this gas furnace has a modulating burner and variable-speed ECM which reduces temperature fluctuations. The unit’s patented WhisperDrive technology keeps the sounds low, while integrated EcoTrak technology customizes the system and tracks it according to climate and usage. As a high-end unit, the Coleman Echelon is among the most expensive available on the market. Up to 95.1% available, this two-stage heat and variable speed blower model feature noise-reducing technology and temperature modulation. It is a mid-range unit and offers relatively affordable pricing. The Goodman GMEC96 is a two-stage heater with a multiple speed ECM blower and multi-position configuration. It’s among the more price models, but also has an AFUE rating of up to 96%. It features optional side venting and a left or right connection for both gas and electrical service. 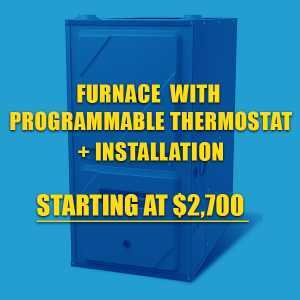 DeMarco Mechanical installs a variety of furnace products, and can help you match the best furnace to your home’s heating needs. Contact us today for a free consultation, and allow us to guide you to the best possible selection for your home. We stock and install Goodman/Amana, Lennox, Trane, Keep Right, Ducane, Rheem, York and Carrier. Contact DeMarco Mechanical for heating and cooling services, ductless HVAC installation, furnace and air conditioner repair, and general HVAC contracting services throughout the GTA. We service Toronto, Markham, North York, Vaughan, Scarborough, Oakville, Mississauga, Concord, Newmarket, Oshawa, Richmond Hill, Aurora, Hamilton and further. Get in touch with us today!